The University of Missouri veterinary medical complex is made up of five buildings on the southeast corner of the Columbia MU campus: Connaway Hall, the Veterinary Diagnostic Laboratory, the Veterinary Medicine Building, the Veterinary Health Center (Clydesdale Hall), and the Veterinary Medical Science Building. The college also operates Middlebush Farm, where students gain practical experience with large animal medicine. Connaway Hall houses the Department of Veterinary Pathobiology and its associated teaching and research programs. The facility provides state-of-the-art research labs specializing in infectious disease research, genetic testing and molecular biology. The Veterinary Medicine Building features teaching laboratories, classrooms, seminar rooms, computer laboratories, administrative offices, and the veterinary medical library. This building also houses facilities for electron microscopy, and the H. Richard Adams Conference Room and Auditorium, a 250-seat conference center and auditorium used for meetings, research, teaching and other instructional purposes. It features audiovisual and computer support equipment. Each year, the Veterinary Health Center hospitals (VHC) care for about 17,000 hospitalized animals and thousands more on farms. Many of these animals come from the Columbia area for primary care and emergency care, while others are referred by veterinarians throughout the Midwest for our specialized services. Working alongside faculty and staff, students pursuing the DVM degree and interns and residents engaged in postgraduate training actively participate in each phase of clinical care. MU’s location between two major cities and adjacent rural areas allows for a strong caseload in small animal, equine and food animal species. Featuring 152,000 square feet and advanced equipment, Clydesdale Hall is the central location for clinical care, and houses three specialized hospitals. The Equine Hospital occupies approximately one-third of the first floor and includes about 32 stalls, a neonatal unit, two large surgery suites, a special diagnostics room, access to a 3-T magnetic resonance imaging (MRI) unit large enough to accommodate horses, an arena and a treadmill for evaluation of equine lameness. An equine field-service program complements in-hospital services. The Food Animal Hospital also occupies approximately one-third of the first floor and provides comprehensive health care for livestock. The design of the corrals, stalls, and chutes permits efficient safe movement and restraint of cattle. About 35 stalls are available; some are designed to manage paralyzed cattle and recumbent calves. The Food Animal Ambulatory Service provides individual and herd-health services for area livestock through fully equipped vehicles. The Small Animal Hospital has 16 examination rooms (one specialized for oncology examinations, two for cardiology exams, and two for specialized ophthalmology cases), and more than 150 cages and runs. Each exam room contains a computer for quick access to the hospital information system so students can enter and retrieve client and patient data while examining the patient. 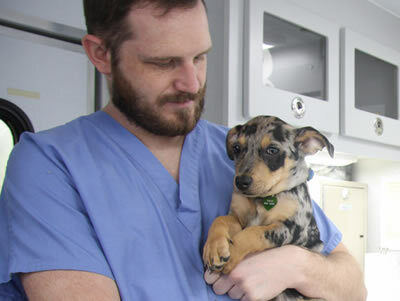 Veterinarians throughout the region refer clients to the Small Animal Hospital to take advantage of veterinarians with specialized training and state-of-the-art equipment. The hospital also provides preventive medicine, dentistry and routine small animal outpatient care through the Community Practice Service. The VHC has an emergency and critical care unit staffed 24 hours a day, a 3-T magnetic resonance imaging (MRI) unit, an underwater treadmill for dogs recovering from orthopedic and neurological conditions, computerized tomography, a linear accelerator to administer radiation therapy, the Hill’s Endoscopy Center, a cardiac catheterization laboratory, and specialized orthopedic and ophthalmology surgical suites. The Veterinary Health Center is one of only a few institutions in the United States that can offer veterinary positron emission tomography (PET) scans. The Veterinary Health Center‒Wentzville is a satellite facility offering radiation oncology therapy to cats and dogs referred there for treatment by their regular veterinarians, behavioral services and dermatology care. The Wentzville facility offers some new clinical trials for cancer treatment for animal patients that qualify to participate in those trials. Middlebush Farm is a 288-acre farm south of Columbia that provides space and facilities for theriogenology instruction and veterinary medical research projects. A college-owned herd of cattle is maintained at this farm for teaching purposes. The Veterinary Medical Diagnostic Laboratory provides in-depth diagnostic support to veterinary practitioners, livestock and poultry industry interests, companion animal interests, wildlife conservationists, scientists utilizing animals in their research, state and regulatory officials, and VHC clinicians. It is one of 43 veterinary medical diagnostic laboratory systems in the nation accredited by the American Association of Veterinary Laboratory Diagnosticians. The Veterinary Medical Science Building accommodates research laboratories and office space for faculty and graduate students in the Departments of Biomedical Sciences, Veterinary Pathobiology, Veterinary Medicine and Surgery and the Veterinary Medical Diagnostic Laboratory. The Zalk Veterinary Medical Library provides access to a broad range of information resources, including print and electronic textbooks, literature databases, and online journals. The library also provides online research guides and face-to-face instruction on finding and evaluating the veterinary literature. The library collects information on all aspect of veterinary medicine, including pet therapy, human-animal bond, animal welfare, animal law, pet bereavement, comparative medicine, and laboratory animals. There are specialized collections in veterinary history, mules and Clydesdales. The veterinary collection is complemented by science, engineering, and medical collections found across the University of Missouri Libraries. Established in 1951, the library is the only one of its kind in the state. Its unique and historical resources frequently fill the needs of researchers not only in Missouri, but across the nation and around the world. In 2005, the library was named the Zalk Veterinary Medical Library in honor of Thelma Zalk. MU is one of the few universities in which a College of Veterinary Medicine and a School of Medicine are on the same campus with a School of Nursing; School of Health Professions; College of Agriculture, Food and Natural Resources (with a Department of Animal Science); a College of Arts and Science; and a College of Engineering. Interdisciplinary programs within the University permit the sharing of additional facilities by the MU College of Veterinary Medicine. The Low-Level Radiation Laboratory, located within the College of Agriculture, Food and Natural Resources, is a low-level, whole-body radiation counter measuring natural and induced radioactivity in animals and humans. MU and its researchers have a $2.3 million high-powered nuclear magnetic resonance spectrometer (NMR), only the second of its generation in the United States and the only one in Missouri. Scientists use the NMR to see molecules in three dimensions and view their interactions. Understanding these interactions is crucial to understanding health and disease. At the Dalton Cardiovascular Research Center, Mizzou scientists from such fields as biochemistry, biological engineering, electrical engineering, medicine, physiology and veterinary medicine come together and apply their particular expertise to health problems like hypertension, cancer, cystic fibrosis and heart disease. The Nuclear Reactor Research Facility, the largest university-based research nuclear reactor in the nation, is in MU Research Park. College of Veterinary Medicine faculty conduct radiobiological experiments at the facility. MU’s National Swine Resource and Research Center is the country’s only repository and distribution for swine models. MU also houses the only Rat Resource and Research Center (RRRC) and one of three Mutant Mouse Resource and Research Centers (MMRC) in the United States. The MU Metagenomics Center is closely affiliated with the NIH-funded MMRC and RRRC and is managed and operated by the same team of experts. The center is a comprehensive resource for microbiological research performed at Mizzou, other universities and private entities around the country. The MU Laboratory for Infectious Disease Research is part of our nation’s biodefense effort. This $16.5 million facility aids researchers in fighting pathogens such as West Nile virus. It includes laboratories and associated research support areas, and is one of only 13 such structures in the United States. At the Bond Life Sciences Center, novel research opportunities arise from interactions among talented and diverse scientists from the School of Medicine and the colleges of Agriculture, Food and Natural Resources, Arts and Science, Engineering, Human Environmental Sciences and Veterinary Medicine. The Research Center for Human-Animal Interaction, a collaboration with the College of Veterinary Medicine and the Sinclair School of Nursing, facilitates a number of community programs that engage individuals in activities focusing on the health benefits of human-animal interaction.